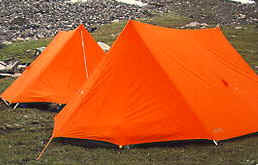 The Force 10 Hike Tents are our main tent for hiking use. Whilst they can be used for “on-site” camping, we normally discourage this particular use for them, preferring them to be used as designed! Over the years, Vango have unfortunately changed the names and sizes of their tents, so what used to be a Mark 3 tent they now called a Mark 4. Thanks Vango Marketing Department! Bearing this in mind, we consider we have three sizes of Force 10 tent, which we call Mark 3, Mark 4 and Mark 5 even though they were not the original descriptions. These are very lightweight hike tents designed for specialist uses only. Each sleeps 3 and weighs 3.2Kg.